Prevention is a priority of our care of patients. The basic and most effective form of preventive care of your teeth are preventive examination and well performed home and/or professional oral hygiene. Proper preventive care helps to eliminate problems in the oral cavity and ensure your long dental health. Dental hygiene is recommended regularly, 3 times a year, which is enough to detect any negative changes, which you are not able to recognize by yourself. Do you think the professional treatment made by dental hygienist is useless and you don´t need it? Mistake! Even apparently clean teeth need a professional care from time to time. It is common in our practice that the patient is recommended for dental hygiene after entry examination. 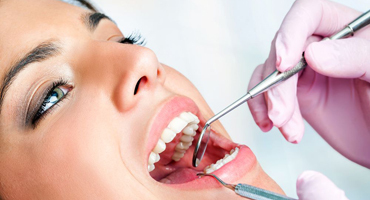 When the required cleanness of teeth and gums is achieved the appointment with a dentist is made. 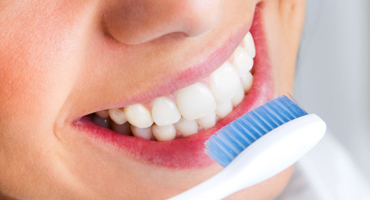 During the treatment we show you what to improve or avoid while brushing your teeth. 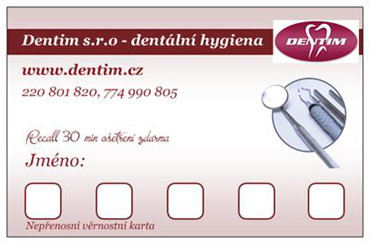 At the first dental hygiene visit you´ll get a loyalty card from us. Each sixth treatment – recall 30 minutes is for free. Are you interested in dental hygiene? Do you need more information?